Well, after two weeks of touring great studios how do you feel? Overwhelmed? Me too. 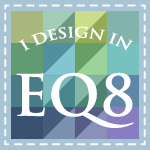 These great designers have wonderful spaces! 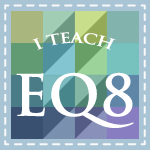 But I am pleased to invite you to take a quick tour of mine. My studio is in the basement of my small house in Ottawa, KS. So that means everything has to go down or up these stairs. Yes, that really is pink carpet, and I have to say it's not my fault! It was here when we bought the house 21 years ago and we have not changed it. Turn right at the bottom of the stairs and you enter the Man Cave where my husband has his room for all things guy-related. Turn left and you enter my studio. First a word. . . My studio used to be my son's bedroom but when he went off to college he was no sooner out the door when we were remodeling the space. Go HERE and see the complete remodel. That was in 2009. Here is what it looks like now, nearly 6 years later. As you turn left and walk into the studio you see a glimpse of the "veranda" and my machine table. My machine table is part of an old computer desk and the veranda is a huge wallpaper mural which covers the whole end of the room and wraps around the corner. Just behind my sewing chair is my ironing table and an old pie safe that I use to store supplies. First, this is my sewing station. You can see part of the veranda and my thread storage. I wish I had a better way to store thread to keep the dust off, but as you will see this is a relatively small studio. My comfy chair spins so that I can turn around and press. I have a Bernina 440 machine and another smaller Bernina 240 which I keep packed up ready to travel to classes or retreats. All of my tools are within easy reach. To the right, I keep all the notions I use all the time in a spinning Pampered Chef tool caddy. Works great for me and everything is at my fingertips. Then my machine and large acrylic table sit in the middle between two big Ott Lights and a smaller bright light on the machine. Machine needles and bobbins are close by. Just to the left of my machine you can see a pink cutting mat taped to my table so I can do paper piecing right here at my machine. The acrylic table can be removed when I put my embroidery module on the machine and all my embroidery threads are close where I can reach them as I sew. In the corner of the table is my serger. My husband bought this for my birthday more than 20 years ago, and it has been so good I have had no reason to replace it. I sure would love a new one with self threading and more bells and whistles, but this one has served me well for many years. The space behind my chair is the pressing station and you can also see my cotton thread (Masterpiece) nearby. The two drawers contain my sewing gloves, machine manuals, pressing hams and machine accessories. And of course there are quilts on every wall. They are mostly small ones, but they are ones that I love which I made or were made for me by others. 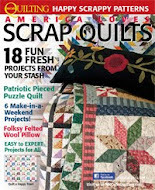 Several are by master quilter and expert in miniature quilt Jayne Turner, who wrote and incredible book on Miniature quilts. I have several of Jayne's quilts on my walls, including the one on top in the picture above. I made the stained glass quilt below it at a workshop by Linda Everhart some years ago. In the basket I put pressing supplies and the pattern I am working on. More tools hand on the hook on the side of the Pie Safe. I hang applique pressing sheets from a hole I punched in each one and a caddy that packs into my sewing tote when I go to class. I really work on finding ways to use the space efficiently since the room is only 12' x 24'. You can tell I like a lot of light on my work, so I have lamps on every surface and overhead pin lights focused on each area in the room. The pressing table is a Big Board sitting atop a folding table. Under the pressing table (set at a height to sit and press) are baskets for scraps. The flooring is actually cushioned vinyl that looks like wood! I love the look and it is easy on the feet. The floor under it is cement! Turn around and you see the rest of the room. The cutting table folds up and has drawers and cupboards on both sides. I only have one of the leaves up on the table. When I am doing large projects I can turn the table and open the other leaf. I have a mat the size of the entire table when I have the need to open it up fully. The blue box in front and the red one beneath it have all the things I need when I set up a booth at a show. It is convenient to grab the booth box, and off I go with everything I need for set up on there. Along the wall on the right, next to the pie safe, where I store pressing items, embroidery frames and stabilizers, and some small quilts. Beyond the cupboard is a set of three large shelving units my husband got for me last Christmas. then quilt storage. Since I do a lot of trunk shows I need quilts handy and ready to pack up. There are large suitcases on the floor beneath the shelves which I can use to haul quilts. At the end of the room is a window and book shelves for my quilting books and magazines. the window is at ground level and under the deck so there is no light coming in. To keep the room bright and cheerful I painted the walls yellow and the ceiling light blue! 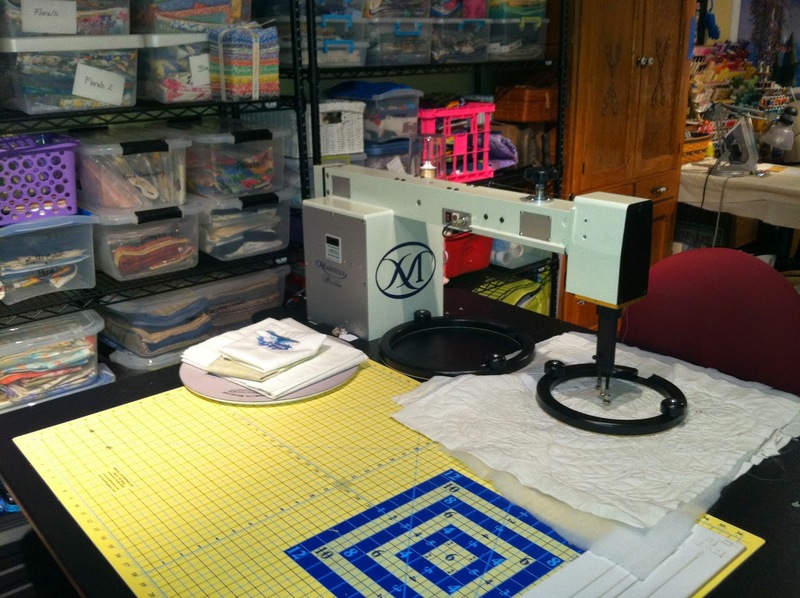 The plastic drawer units hold quilting stencils, embroidery supplies, serger thread, batting scraps, and tote bags. In the middle of the room is my sit-down long arm. It is a 22" Martelli long arm with a 4'x 4' electric table. It has a build in cutting mat on the back side and I can raise and lower it for work standing or sitting. I really love it. My new Brother Scan N Cut is set up on the cutting side, ready to work on a new Block of the Month pattern. Below the table are bins with large batting scraps and another bin with projects in process. On the wall opposite the shelves are two big closets. One is my fabric storage closet, and the other is my husband's closet and entry to the under stairs storage. Here is the fabric storage closet. It has shelves and bins. The drawers store holiday fabric, my collection of flamingo fabric and patterns, fusible web, and fabric for special projects. The other half of the closest has fabric bins sorted by color, and large drawers with wide backs and large yardage cuts. The doors are covered with vinyl back tablecloths I use as a design wall. My posable dude sits on the top of my long arm to keep me entertained while I quilt. Below is another picture of my long arm with some fabric I was practicing on and the round holder used to move the fabric. You can see the cutting mat better in this view. This set of white drawers are all UFO's. Ok not proud of the fact that I have alot of UFOs but at least I know where they are. These are some of my retirement projects. LOL Above the drawers, in this alcove, are shelves with sewing notions, zippers, ribbons, and pattern boxes. You can see the ruler racks on the left. Now we are back around to my cutting table where I store all my rulers on the table in a stand and on the wall in a rack. Next to the door is a small shelf where I keep an embroidery basket, a tin of pincushions, binding scraps, and my helper, Rockie. On the day I took these pictures, it was nearly 70 outside so I worked at my outside office, on my back porch. Of course I can never go anywhere alone, my helper Buster and Rockie were nearby. My outdoor desk with laptop where I do a lot of my design work in nice weather. Thanks for taking the tour of my studio. Leave a comment and you will be entered to win a free pattern. I will give away 5 patterns to five random commentors. If you go to my Facebook Page and like it or leave a comment you will be entered to win a pattern and two charm packs to make the pattern! Don't forget to check out my website for my new patterns, my January sale, and my January 10% pattern special discount when you use the MGD10% coupon code at checkout. Good through January 30! Oh, and did I forget. . . . .?? Today is my last day of work as a college professor. 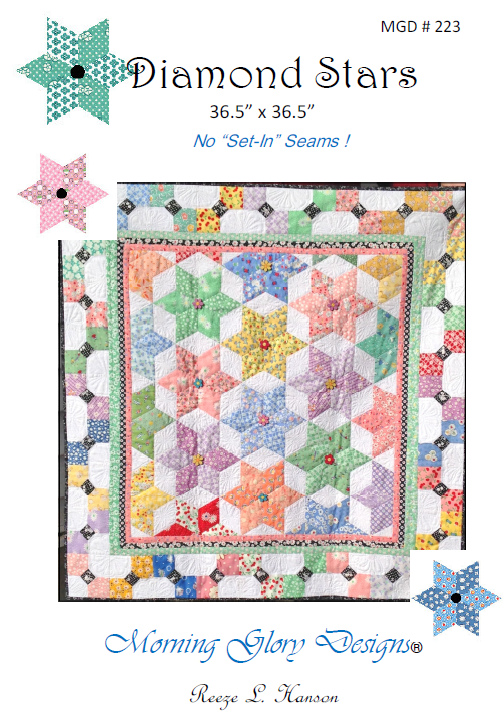 sweet stars!...would be perfect for a quilt for my grand-daughter! Congratulations on your retirement! Love the floor in your studio. Thanks so much for sharing your studio - I just got another idea for mine! This has been a fabulous tour and my head is swimming with bits from each studio to incorporate into my little studio/tv-computer room /office! And thanks for the chance to win :) Congratulations and best wishes on your retirement! What a great studio - I would love a space of my own!! Congratulations on your retirement! It looks like you will have plenty to keep you busy. Thanks for sharing your studio and for the giveaway. Congratulations on retirement. It will be wonderful I am a former KU person my self. I think you have a wonderful organization going there. I like the tool caddy a lot. Congrats on your retirement. It looks like you will have plenty to occupy your time. I really like your veranda, a great way to bring in some light and inspiration. Congratulations on retirement. Think your studio is wonderful, lots of neat items. LOVE your studio, Reeze! You've got a lot crammed into your allotted space! One suggestion: OMG ditch that pink carpeting! Put Bruce to work!! After today, you'll have plenty of time to "supervise!" This has been a great studio tour. I've learned something new from every single one and so enjoyed getting to see your cozy space. The pampered chef lazy Susan is just the thing I've been looking for! So I'm off to find a rep. Thanks so much for sharing and congratulations on your retirement. Congratulations, Reeze, on your retirement. I sometimes am amazed at all you've done and worked, too. Here's to lots more stitching in the years ahead. Great studio! Looks to me like you have utilized every ounce of space and that you've arranged it so things are very accessible. Your Martelli is something that really appeals to me; I must check them out. I loved your studio, especially your 'view', what a clever idea! Congratulations on your retirement, I'm loving mine!! Congratulations on your retirement! You are going to love Sunday nights! Looks like you have a very efficient arrangement, and one that works for you. Congratulations on the retirement from one career, as I know you are not retiring from all of life. Great studio - so neat and organized!!! Love your porch and your buddies :) Congratulations on retiring - love it!!! Happy Retirement! Watch out girls, here comes Reese! I want to see how long it takes you to realize that you could get more done while you were working! lol. Wow! Then this is a happy, happy Friday for you! Enjoy your retirement! Love your organized space with so much packed in. Happy retirement!! Congratulations on your last day of college work. May you find all the time you need for your passions. Lovely studio and how much you have packed in so efficiently, thanks for the tour. Loved seeing your studio. I am currently trying to convert a small bedroom into a sewing room. It is frustrating trying to make it work. I'll get there some day. Thanks for sharing. Thanks for sharing your studio with us. Congratulations on your retirement! I enjoyed your tour! Congrats on your retirement...enjoy! Thanks for the "grand" tour of your studio. Looks wonderful. Enjoy your retirement. I know I enjoy mine! You have a wonderful studio, so many good solutions! I love your studio! I've seen so many through this hop and I definitely need to invest in lots of bins! I'm fairly new, so I have a long way to go on getting a stash and organizing what I have, thanks so much for giving me a peek! Also, thanks for the giveaway, your patterns are beautiful! Lovely studio tour. All the best on your retirement. Congratulations. First of all - congrats on being retired!! Now the fun really begins!! And your studio is fabulous!! And huge!! And did I say fabulous?? A lot of creating going on in that room and in the annex on the back deck!! You have made very efficient use of your space! I love your "veranda" - it must brighten up that basement room significantly. Congratulations on your retirement - or should I say partial retirement, as it looks like you have lots of quilty work to keep you busy. Lucky Lucky you. I have 2 years10 months and 26 days but whose counting. LOL Congratulataions. We found some property that we hope to build and retire to when the time comes and I found the perfect floor plan. It has a game room and a sewing room. My husband complained it had on 2 bathrooms. I can remedy that. I would love to have more quilt room space. Thanks for sharing your room. I love seeing where other people sew. what a great space and I enjoy all the pet companions that are quilters by association. ANd YAY!!! You are retired, what fun, now is when the work starts, right? Love that star and bow pattern. sweet!